“If it came from a plant, eat it; if it was made in a plant, don’t”. The Farm Organics is a lot more than just organic farming. It is all about organic living. Whether we want to eat consciously, learn to farm and grow our own foods, use conscious cosmetics or simply enjoy a fresh farm dinner; The Farm Organics will cater to it. At The Farm we believe in living kindly and with the balance of nature. This starts with what we consume. What we eat will define our health. You can now have your own organic patch where you can come and learn to farm. Rent a Patch and grow your greens, bring your family for a farmers day or simply partake in activities we announce. We also organise Farm to Fork dinners where you can book a table for relishing a feast of fresh, healthy and organic foods prepared slowly. We partner with other organic farms and chefs to bring you the best of recipes. 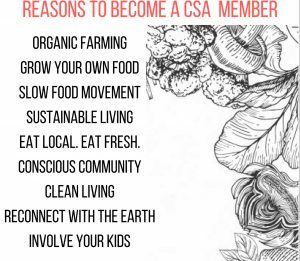 Community Supported Agriculture (CSA) at The Farm was launched in January 2018. Since then we have had a full house with our memberships and have collectively grown and harvested over 50 varieties of herbs and vegetables. We have a dedicated team who handholds you through the entire membership. 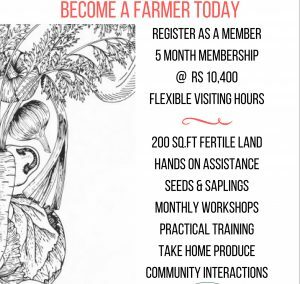 To know more, become a weekend farmer, book a table or just chat please contact us right away.